The first sale doctrine limits the exclusive rights that survive the initial authorized sale of an item protected by intellectual property (IP) rights, and therefore limits the ability of IP owners to impose post-sale restraints on the distribution or use of items embodying their IP. While the doctrine has deep common law and statutory roots, its exact rationale and scope have never been fully explored and articulated. As a result, the law remains somewhat unsettled, in particular with respect to the ability of IP owners to opt-out of the doctrine and with respect to the applicability of the doctrine to situations of parallel importation. This Article provides answers to these unsettled issues. 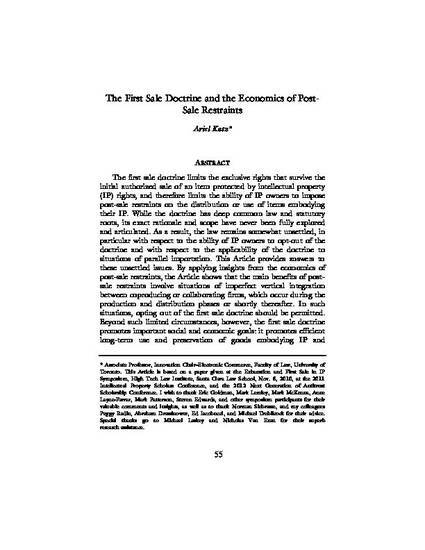 By applying insights from the economics of post-sale restraints, the Article shows that the main benefits of post-sale restraints involve situations of imperfect vertical integration between coproducing or collaborating firms, which occur during the production and distribution phases or shortly thereafter. In such situations, opting out of the first sale doctrine should be permitted. Beyond such limited circumstances, however, the first sale doctrine promotes important social and economic goals: it promotes efficient long-term use and preservation of goods embodying IP and facilitates user-innovation. Therefore, contrary to some other views, I conclude that the economics of post-sale restraints confirm the validity and support the continued vitality of the first sale doctrine.